Halfway through the Brazos Valley Off-Road Ranch I contemplate turning back. But there is no way back, only forward. The 2009 Nissan Frontier PRO4X has gotten me this far. Can it get me out? Pulling up to the large four-wheel playground on the outskirts of Bryan, Texas, which is itself the outskirts of another small town, I'm not sure what to expect. I'm meeting up with the Bryan-College Station Chapter of the TX4WD club and I'm doing this in an import. Will I stand out? As I expected, the grounds are populated mostly by Jeeps, a seriously jacked-up Chevy S10 ZR2, and a Ford Explorer ready to pick up the kids from soccer practice — if they happen to by playing soccer at the bottom of the Grand Canyon. I put on my best Texan smile and introduce myself, hoping for the best. Thankfully, the group is as welcoming as a bucket full of blueberry muffins and, because they're almost all using daily drivers, their philosophy is: we want you to go home with stories, not parts of your truck — reassuring when the $29,400 truck doesn't belong to you. As there are other novices in the group, we set out for the "playground" for a bit of practice. Practice typically implies something basic to start with. In this case, "practice" was driving into and out of a small, but deep, scar in the ground (it felt like a ravine). With BCSTX4WD president Jim Taylor guiding me, I put the Frontier in 4-low to take advantage of increased torque at the wheels. 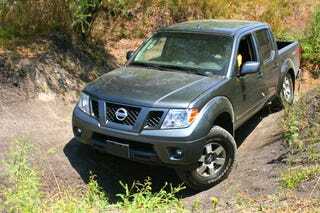 The trick with an independent-front-suspension vehicle like the Nissan is to keep the deepest part of the trail between the front wheels. All of this sort of goes out the window when you actually do it. At this point I'm mostly keeping my eyes glued to Jim, hoping to not embarrass myself. As with racing, it's all about taking the right line. Into the ravine I'm being led on a clear line, straddling the dry sand. The 4.0-liter DOHC V6 pumps out 261 HP and a useful 281 lb-ft of torque, enough to easily pull the truck out of the sand. Climbing out of the pit I suddenly feel like I'm being led on a course designed more for its photogenic qualities than its appropriateness as a path. This is confirmed when I'm told to stop while I feel the right rear wheel is suddenly no longer connected the ground. It does make for a good photo and, even without the rear-locking differential engaged, the Frontier pulls itself out like it was nothing. I knock the rear bumper a bit as I leave, but it doesn't do any damage. Assuming this is about the worst we're going to see I confidently watch everyone else go through the playground and others tell me how well the 4x4 system works. Unlike some vehicles advertised as "off road ready," the PRO4X package adds serious equipment, including Bilstein off-road performance shocks and a shift-on-the-fly 4WD system. Clearly, this truck can handle anything. I can handle anything. We're an awesome team. This feelings lasts for about ten minutes, right up to the point I end up staring at a rutted 45-degree hill. Unsure if I can make it and fearing I'm going to fall back, I hit the gas and the Frontier does what it's built to do and throws me and my passengers (probably too quickly) up the hill. The next few obstacles follow a similar theme. My confidence levels are lower than the truck's abilities and I'm pleasantly relieved (and covered with a thick layer of sweat) each time. But then I reverse the two and take a path too narrow to support the truck and bottom out (or, more technically, high-center). This is where everyone adds a few qualifications to the excellent Nissan 4X4 system. It's great — but the truck needs a couple of inches more height, more serious tires and shorter overhangs if it's going to tackle truly difficult terrain. A quick tug and I'm ready to back the truck all the way down the hill we just climbed (it works just as well going the other way) and start heading down a bypass trail. The NIssan continues to eat up the narrow path, snaking through dense woods and jumping over obstacles. The transmission has horizontal gate for switching between first and second gear, making it easy to switch between the two when transitioning from climbing to crossing. I'm once again more confident in my abilities when I make another serious miscalculation. Going down another steep grade I forgo the "keep the deepest part between the front wheels" advice and instead cut one wheel inside the lowest part of the trail. I now have one right wheel firmly planted on the ground and the left rear wheel resting against a bank. The rest of the truck is pivoting back and forth depending on how the passengers in the spacious cab move. This would be a good time to mention the brakes, which are holding the truck firmly in place. I can sense that if I make the wrong move I'm going to end up hanging by my seatbelt. Rather than decide, I honk the horn until someone shows up to guide me out. To prove I'm not completely screwed, someone is nice enough to grab my camera and take a few pictures before they guide the truck out. Apparently, the price of off-road instruction is a few laughs at my expense. The rest of the journey continues on as expected, over ditches and into paths cut through dense brush, the Nissan rarely faltering. Part of me wants to go again. The other part of me wants to get the hell out of there. Though the Frontier manages to propel this novice off-roader across rough terrain, without a few modifications there's the ever present risk of snapping an axle or leaving part of the truck behind. The $28,980 as-tested price tag is less than the starting price of a base Jeep Wrangler Rubicon, and while the PRO4X Frontier certainly isn't as capable as the Jeep, it keeps pace and offers an attractive interior, four doors, and a large bed with a spray-in liner and an adjustable track. After saying my goodbyes to the BCS TX4WD crew I head back to Houston with a dirty truck, a bag full of fried chicken and an iPod hooked up to the radio. That's the other part of this truck— the livable part. Most owners probably won't need to use the locking rear differential or hill-decline assist. Instead, they'll drop a giant container of white gravy into the cupholder and be pleasantly surprised when it fits.